Old footage of Grant Lodge, Elgin. 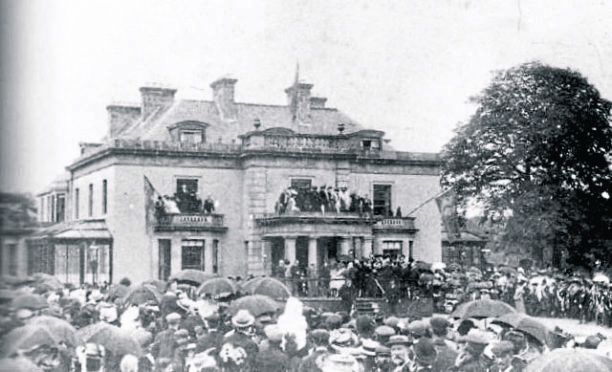 Thousands packed the centre of Elgin in August 1903 to attend the ceremony that officially handed Cooper Park and Grant Lodge into the care of the town. A general holiday was declared to ensure as many people as possible were able to attend the gala celebrations, which marked Sir George Cooper gifting them to residents. Now footage held by the National Library of Scotland has been unearthed showing a grand procession through the High Street to the park. Gentlemen were dressed in their finest top hats for the occasion, which was later described as the biggest of the year, while ladies wore long dresses with flowers in their headwear. Stuart Huyton, a member of the Friends of Grant Lodge campaign group, described the glimpse into the past as “incredible”. He said: “I came across it by chance really while looking for other historical information about the lodge. “You wouldn’t have thought it was in Elgin from the way that everyone was dressed in their finest regalia – it looked like very high society. Sir George bought the former private residence at the end of the 19th Century and donated it to the town after four years of renovations and restoration. During that time a wall which surrounded the 18th Century building was taken down to allow residents open access to it for the first time. Interest in the lodge remains strong to this day. However, the building has lain empty for 15 years now after a fire started in its basement. The custodians of the former library, the Grant Lodge Trust, are preparing a bid to reopen it as a heritage centre while the building has also been put forward as a potential home for a whisky attraction as part of Moray’s growth deal bid.